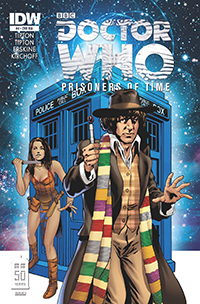 IDW’s celebration of the 50th anniversary of Doctor Who resumes with the Tom Baker issue of Prisoners of Time. While this fourth chapter continues some of the elemental highlights of the previous issue, there are some less-than-stellar characteristics that detract from the plot, though not enough to stop it from being an enjoyable read. The overarching plot of Prisoners of Time looks at an as-of-yet undisclosed villain and enemy of the Doctor, who is invading moments from all 11 of his incarnations and kidnapping his companions. The motives and reasoning are not yet clear as to why he is doing this, though each Doctor will have their own issue, crowning in the 12th issue where presumably all Doctors will join forces. 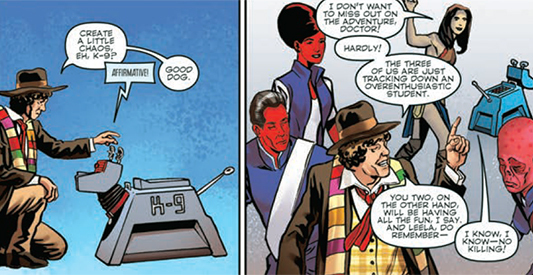 With issue four, we go along with the Fourth Doctor, with his companion Leela and the famous "tin dog", K-9. On a spur of the moment decision to find somewhere for a banquet (or feast), the Doctor decides to take his friends to the planet Agratis, dwelling of Jewel of Fawton. However, upon arrival, they find the planet under legal siege by the Judoon. It is learned that the Jewel has been stolen, and that the Judoon are aggressively hunting for the thief. The Doctor, distinguishing something else afoot, decides to step forward and investigate. While the writing of Scott and David Tipton has been stellar in the previous two editions of Prisoner Of Time, there are elements that falter in this fourth issue. There is indeed, some strength in the script that pays homage to many of the stylistic approaches that showrunner Philip Hinchcliffe and script editor Robert Holmes utilized during the Tom Baker era. As for the criticisms, for one, there is less consideration paid to the relationship between the Doctor and Leela. Coming from a tribal origin, on a violent planet, Leela is martial and bloodthirsty. The Doctor painstakingly disapproves of her tendency to overuse her dagger and Janus thorns, and yet, in Prisoner of Time, we do not see much of this personality conflict. And though there is one mention of the Doctor’s "no killing" rule to Leela, her language is (in the series at least) relatively simplistic, and in this issue we see some rather extended phrases (law enforcement, for example) that would never have been a part of her culture. On the other hand, the presence of a Nu Who monster – in this case, the Judoon – in a Classic Doctor Who era was a stroke of genius. This is not a new trait in expanded universe tales of the Doctor, but after three issues that zoned in on either established villains from relative eras, or new villains, it was nice to see something different thrown into the mix. Additionally, there are some key moments in this issue that pay meticulous attention to the significant approaches of Hinchcliffe and Holmes during the Tom Baker years. Holmes had a tendency to (sometimes subconsciously) zero in on important social commentary of the period, particularly with regards to political ideologues. We have this present in issue four, with a focus and commentary on capitalism specifically. So, though the Tiptons have not scaled their heights of the preceding two issues, their writing for this chapter is still of a good standard. The artwork by Gary Erskine (with thanks to Mike Collins, according to the credits), is a good counterpart for the writing of this issue. While the likenesses are fair, Erskine delivers more of a stylistic approach to this chapter, providing his own flavor and taste to the imagery at hand. Charlie Kirchoff picks up with coloring as he did from the last issue, delivering the same stellar job he did from issue three, though complementing Erskine well. There are also some deliberate coloring attempts that I suspect were designed deliberately to mimic and pay homage to some of the Chroma Key visual effects so often used during the Tom Baker era. This fourth issue of Prisoners of Time is a fun read and soundly put together. While I’ve highlighted some disappointing elements, I feel that fans will delight in reading this for two reasons. Firstly, because Tom Baker is one of the most loved Doctors of all time, having been the longest running actor in the role, and secondly, because the crossover between Classic Who (Baker) and Nu Who (The Judoon), will charm the fans young and old. Prisoners of Time is developing into one of the biggest comic highlights of the year, especially when you look into all of the issues.